Around Thanksgiving, my great-aunt Treba died. I wouldn't say that any death is a good death, but her death was better than most: after living in her own home until age 103, she moved to a nursing home and died peacefully in her sleep a few months later. Her memorial service was scheduled for December 28. This was a time that we could travel, though we don't usually travel then. But this is the sort of thing that you should go to if you can reasonably afford to, and it was clear that we could afford it. So once we talked about it, it was pretty clear that we were going. As I review my pictures from this trip, it's clear that I am in the habit of taking pictures of food, but not in the habit of taking pictures of people. I should try to correct that. Getting through airport security was smooth, particularly because we had decided to pay for the convenience of checking a bag. The snowstorm up and down the east coast didn't hit Pittsburgh, but it complicated our flight anyway. The plane that was to carry us to Charlotte came from Charlotte that morning, and it was delayed leaving Charlotte by the snow there. However, Charlotte had gotten its snow under control by the time we arrived, so the plane leaving Charlotte was not delayed. This turned a fifty-minute connection into a fifteen-minute connection, and it was rather tight. Our arriving gate was in the same terminal as the departing gate, which helped, but by the time we arrived at the departing gate, there were no other passengers waiting in line. Still, there's a wide gap between "almost missed" and "barely missed", and we were on the right side of that gap. We got picked up by my parents and taken back to their house. Sunday evening, we went down to Patty Harvey's house for dinner. Her son David had been my best friend at church during junior high and high school, and he and his wife and son were in town, so it was our first chance to see them in ten years or so. It was really splendid to see them and the Shields (other church friends). The main course of dinner was tamales from a local tamaleria. I liked these quite a lot; eating them felt as if I was participating in a Christmas tradition, though I don't remember eating tamales as a Christmas tradition before. 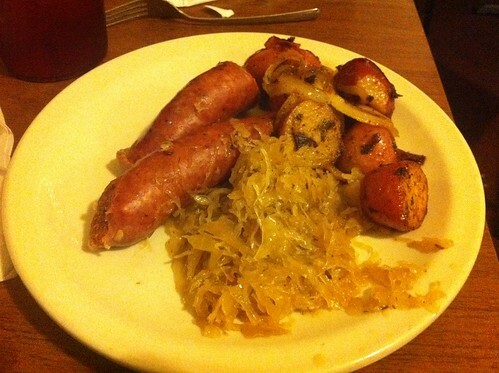 I ordered the sausage, sauerkraut, and Czech fries. The sausage was extremely garlicky, so much so that I noticed it. (I tend not to notice the flavor of garlic, even in fairly large quantities. (This contributed to the unfortunate Stinking Rose incident.) So when I notice garlic, I conclude that it's very garlicky indeed.) The sauerkraut was fairly sweet compared to most sauerkraut I've had, and a little spicy - I assume that the difference is a Czech-vs-other difference. The Czech fries, though, turned out to be just sauteed new potatoes without much seasoning - satisfactory, but not an exotic treat. For dessert, Lori and I shared an apple strudel. 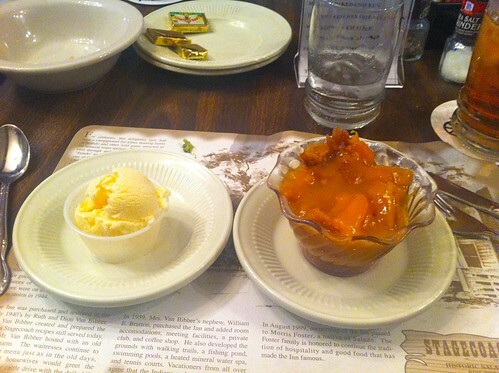 The apple filling was like solid apple butter, totally homogenous. The crust was a bit tough, though - tough enough that it was hard to cut into the strudel with the edge of a fork without squishing out the filling. This is a common failing of strudel, though, and I can't criticize this particular strudel overmuch for it. 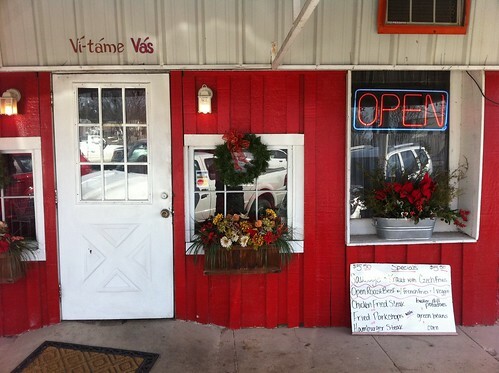 In order to check off another Roadfood-listed stop, I went around the corner to get some kolaches at the Village Bakery. Kolaches are a Tex-Czech dish that have spread well beyond West. They're filled pastries like little Danishes, made from a soft sweet dough like that of Parker House rolls. 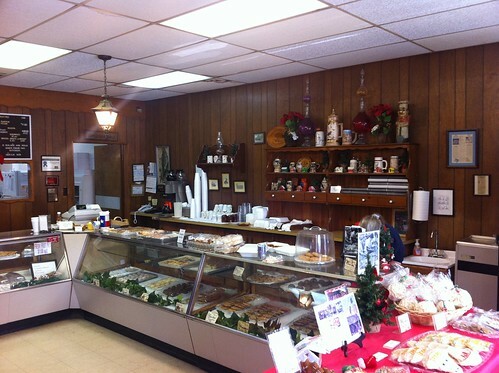 Outside West, they usually contain meat or sausage; the Village Bakery calls that type of kolache klobasniki and says that they originated at the Village Bakery. 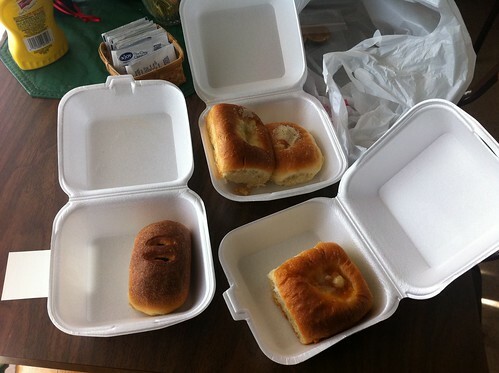 Clockwise from bottom left: A hot sausage klobasniki, a cottage cheese kolache and a cream cheese kolache, an apricot kolache. I didn't feel that the sausage and the sweet dough went well together myself; I think I would have preferred a sweeter kolached. We arrived at our Motel 6 on the southern side of San Antonio around 6pm. I thought that we might press on to Kingsville to visit with relatives, or eat somewhere special in San Antonio, but my parents were happy to eat at the IHOP across the street and call it a night. 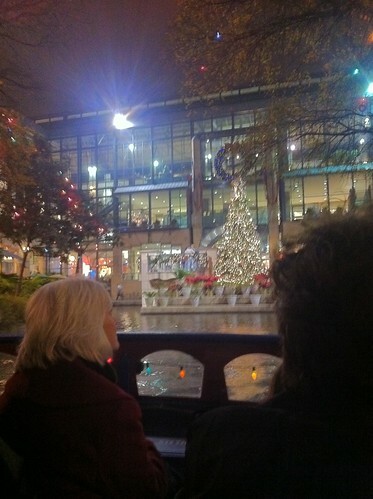 Lori and I borrowed the car and went out. 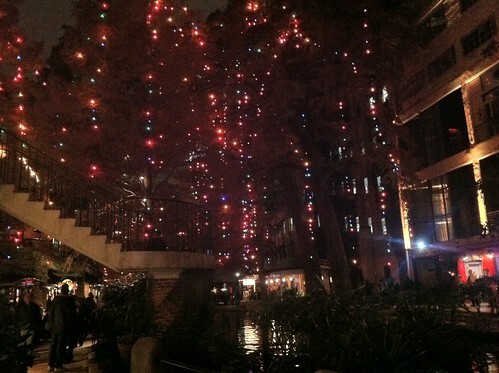 We went to the San Antonio River Walk, because Lori had fond memories of eating Mexican food outdoors on the day after Christmas, and we felt we might not pass this way again. 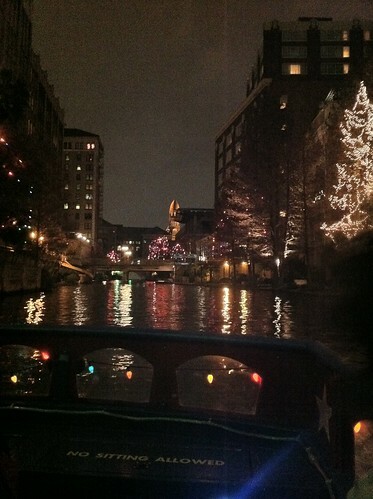 It really was a very nice experience, especially since we had come from snow and freezing temperatures two days ago. 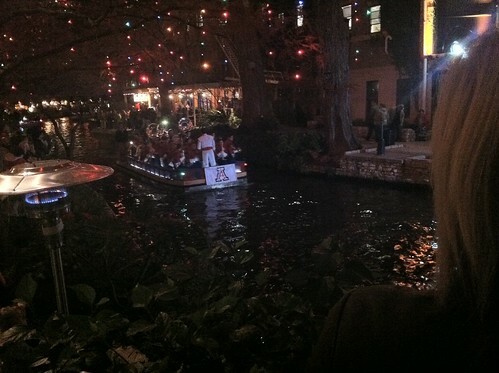 As we were strolling along, we saw some boats with college marching bands playing. I sought but did not find a really great pun about "parade float". For dinner, we went to the Original Mexican Restaurant. 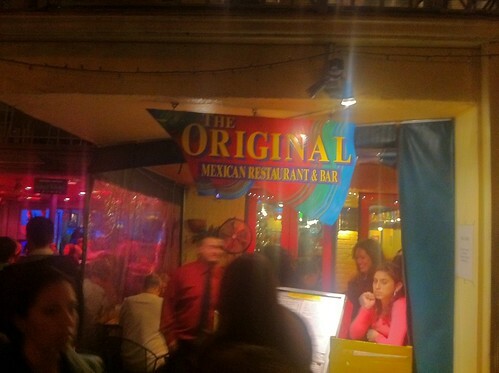 "Original" deserves some skepticism. 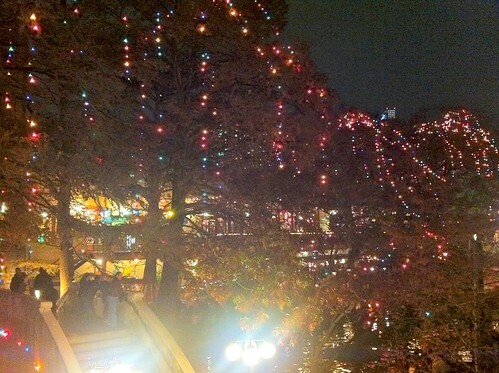 This is not the original Mexican restaurant in San Antonio; it's not even the original Original Mexican Restaurant. (If you're reading this by a text-to-voice system and therefore missing out on the nuances of capitalization, my apologies for your difficulties.) 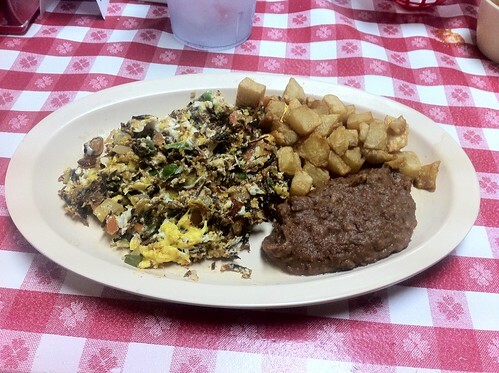 The original Original Mexican Restaurant wasn't the first Mexican restaurant in San Antonio, but it did have some claim to originality; it was more or less the first restaurant to market Tex-Mex food to white people, and as such it did play a significant role in shaping and popularizing Tex-Mex food. But that Original Mexican Restaurant closed in 1960, and this one opened in 1988; its relationship to the predecessor is more or less the relationship of cover artist to original band. 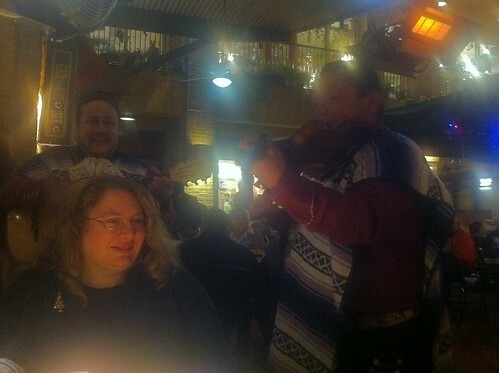 We got serenaded by a mariachi band. This is probably a for-the-tourists experience, but we were tourists and we enjoyed it as something you can't easily get in Pittsburgh. I had carne guisada, served with beans, rice, and San Antonio-style puffy tortillas. 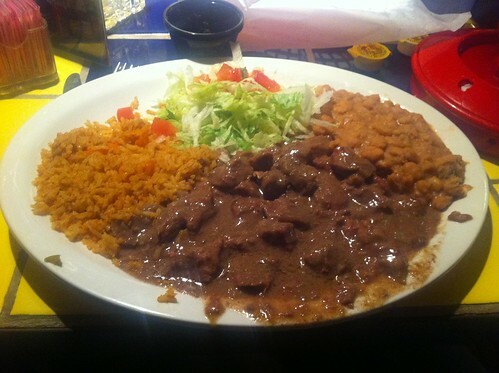 The carne guisada was wonderful - extremely tender, with a very rich, flavorful sauce. I also really enjoyed the beans and the tortillas. Lori got the "burrito grande". This tasted pretty good except for the Velveeta sauce, but the chicken was fairly pink and we didn't understand why. It wasn't due to smoking; we asked if the chicken was smoked, but we were told that it was boiled. I don't think that it was undercooked, because its texture was that of cooked chicken. Lori agreed that it was probably cooked, but nevertheless lost most of her appetite from food-safety worries. 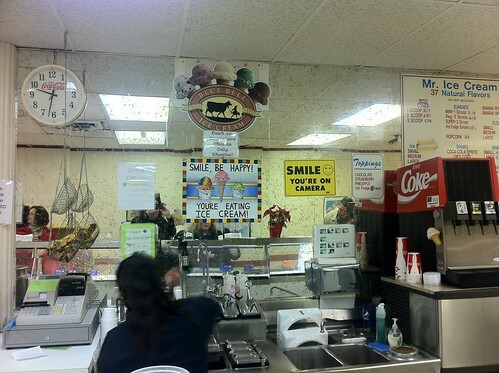 We finished up with a cone of Blue Bell ice cream at Mr. Ice Cream. 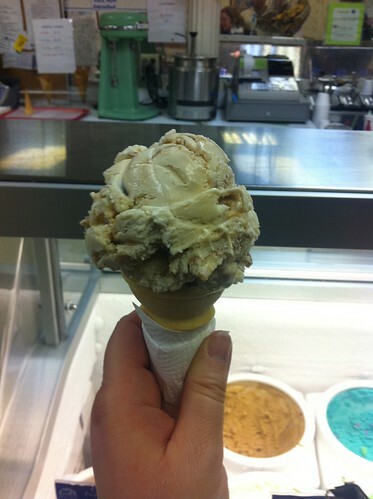 I've heard Blue Bell praised as one of the best of store-brand ice creams, but I can't really distinguish it from the rest of the top 60% of store-brand ice creams. 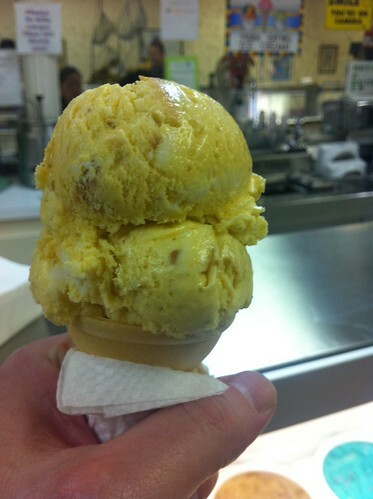 Lori had the triple caramel ice cream, I had the banana pudding flavor. The vanilla wafers made mine somewhat grainy. Breakfast at IHOP and then on the road to Kingsville. The land south of San Antonio is very flat, but I didn't manage to get a good picture from the car of just how flat it is. 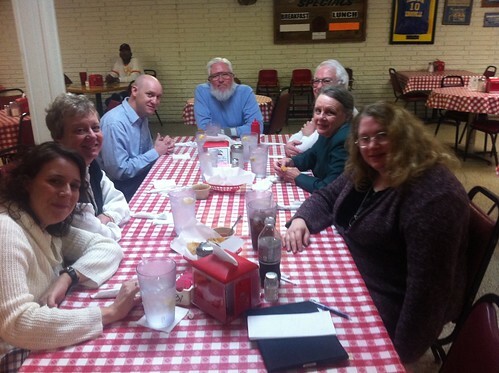 Lunch with my parents and my aunt's family at Lydia's Restaurant in Kingsville. I actually remembered to take a picture of people instead of food. I had my first encounter with machacado con huevo, after first checking Wikipedia to learn what machacado is. It's shredded beef jerky (carne seca style) cooked with eggs, onions, and peppers - it had a strong beef-and-seasoning flavor and I quite liked it. The hash browns that it came with were too greasy for my taste, though. I loved the chance to talk with the Graves and wish there had been more opportunity. Adam teaches deaf and blind kids at the Texas School for the Blind, and seems to have found a special niche there. This led to a conversation about the accessibility features of the iPad, which ended up very useful for me - I won't use VoiceOver soon, but I'll use the zooming a lot in my work. From Lydia's, we went to the memorial service and reception, which was basically a big reunion with relatives I don't know as well as I would like, interrupted by a service in the church. But there were fascinating tidbits from the testimonials in the service. 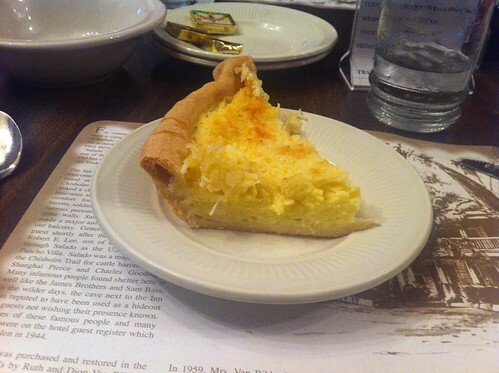 For example, one of the testimonials was given by a neighbor of Treba's, who had lived across the street from Treba for over 70 years. That really boggles my mind. I wish I knew these relatives better, but I've only seen them at intervals of several years over the past few decades. But multiple people have said how much they appreciated our being there, so I think that our coming did make things a little bit better, and I'm glad for that. 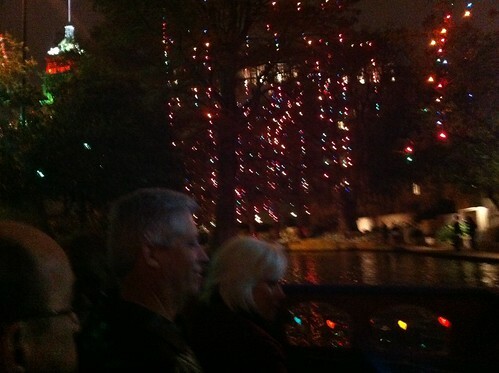 We left the after-memorial reception around 4:30 or 5, which was a bit early for supper. But there is hardly anything on the road for almost three hours between Kingsville and San Antonio, and that would put dinner later than my parents wanted to eat. Sto we stopped for sandwiches at Young's Pizza, a pizza joint serving Texas A&M Kingsville. 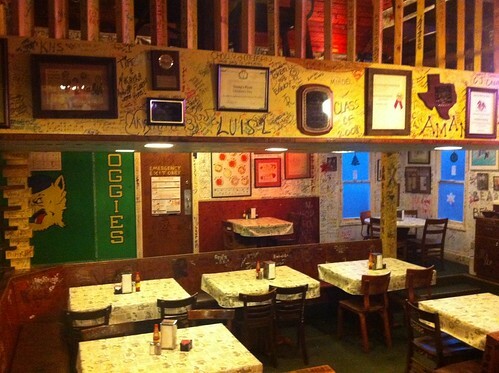 Young's is decorated with graffiti; a sign entreats customers to write on the walls, but not on the tablecloths. Lori and I split a beef brisket barbecue sandwich for a token taste of barbecue for our Texas trip. 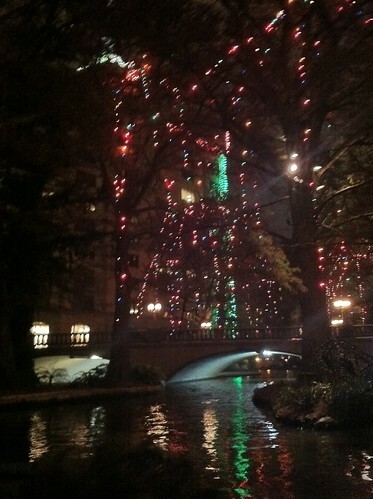 We thought we might go out for a meal in San Antonio, but didn't manage it. Another early start and breakfast at IHOP. 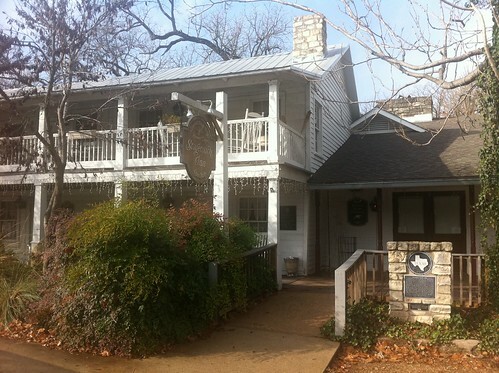 We planned a lunch with the Graves at the Stagecoach Inn in Salado, TX. Salado is a small arts community of a few thousand people with 125 years of history and eight years as an incorporated village. 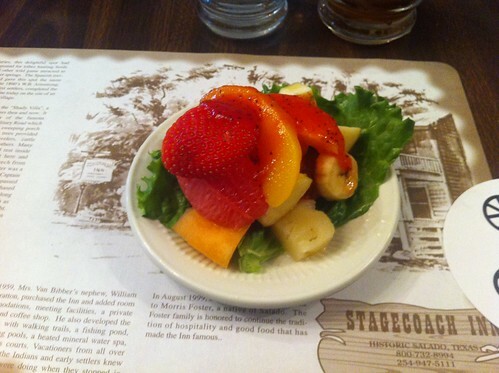 The Stagecoach Inn has been there for longer - it has been in business since 1861. 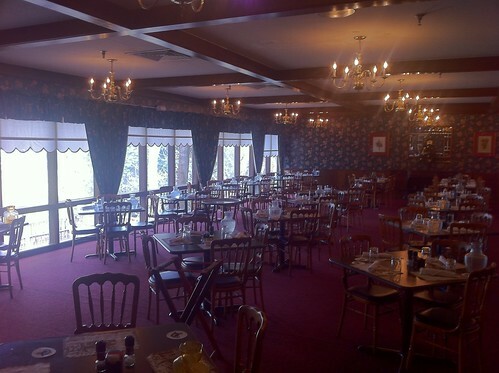 I know nothing about the hotel, but the restroom is a lovely genteel country restaurant. There's no printed menu; the waitstaff recites the menu from memory. Most of us ordered the chicken fried steak. 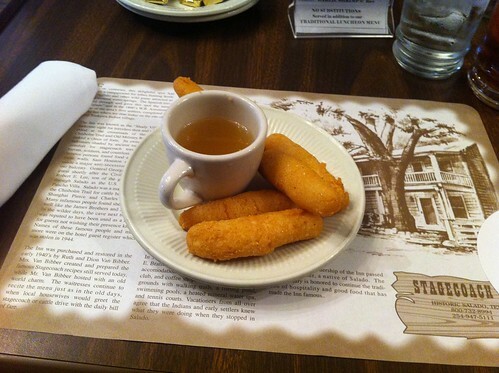 When most restaurants would bring out a basket of bread, the Stagecoach inn brings each diner a demitasse of chicken broth and some hush puppies. 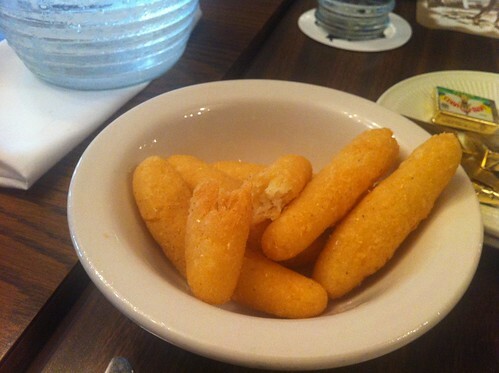 These are my favorite hush puppies I've encountered: light, finger-sized golden bites, very different from the heavy spheres I usually get as hush puppies. My salad course was a fruit salad with a poppyseed dressing, good, but not nearly as good as it would be with fruit in season. 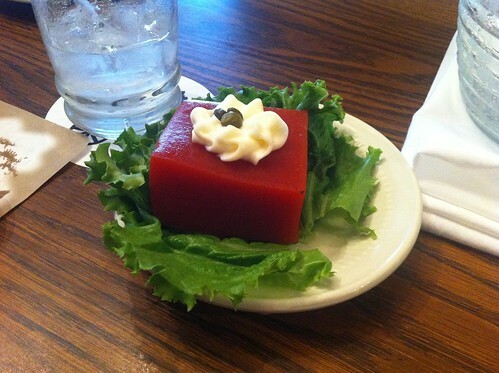 My mother got a very pretty tomato aspic. When the waitress brought another bowl of piping hot hush puppies, she warned us, "Be careful, or you'll burn your big tongue right off!" My plate. 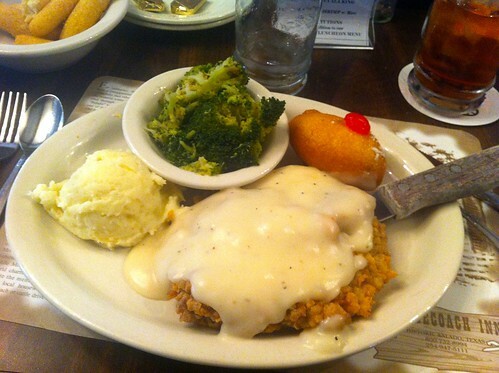 Clockwise from the bottom: chicken fried steak, mashed potatoes, broccoli, and a banana fritter. The chicken fried steak and the banana fritter were both very good. 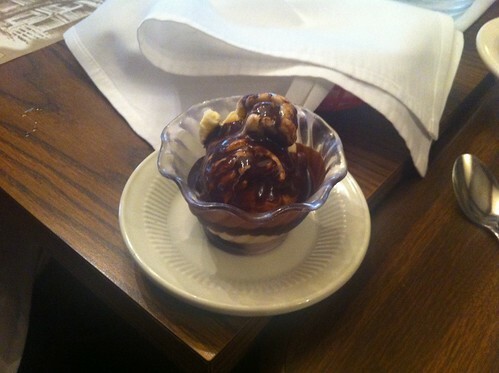 The desserts were fine, but not the best part of the meal. 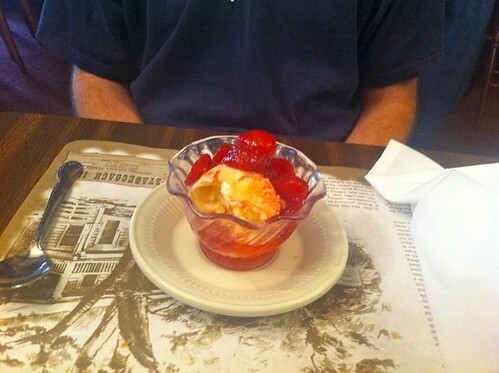 In order, Lori's coconut cream pie, my peach cobbler, Adam's ice cream with strawberries, Allison's ice cream with chocolate-sherry sauce. It was a lovely meal, well worth Roadfood inclusion. 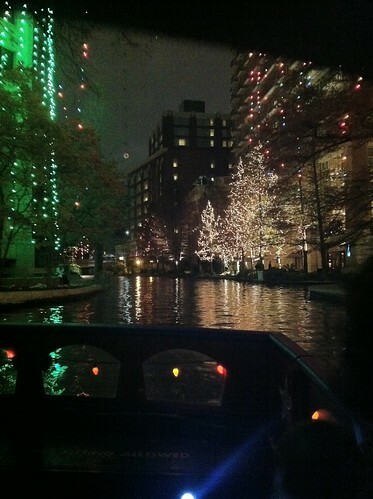 From there, more hours of driving directly to DFW airport, and there to fly home. We weren't body-scanned on the returning flight either. Dinner was a chicken snack at Bojangles, because I'd seen that the Travelin Man had also flown through Charlotte earlier that day and had looked forward to eating at Bojangles. It was tasty fried chicken, but a bit too spicy for Lori's pleasure.